Climate change will likely alter seasonal air temperatures and watershed hydrology, which will affect the presence, distribution, and health of local plant species. Tidal wetland habitats are particularly vulnerable to sea level rise. However, the fate of the plant communities associated with those habitats has not yet been determined. Elevated atmospheric carbon dioxide, a greenhouse gas that contributes to climate change, may encourage plant growth if other changing conditions do not limit plant production. Climate change may result in additional stressors for already endangered plant species (e.g., Western lily). Swiss needle cast pathogen on Douglas fir needles. Photo: OR Dept of Forestry. Climate change has the distinct potential to affect local vegetation communities through changing weather patterns and watershed hydrology, increased air temperatures, and rising sea level. Some of these changes are likely to be exacerbated by human activities (Erwin 2009, Scavia et al. 2002). However, determining the specific effects of climate change on local tidal vegetation will be difficult since climate change models are designed to predict change at global or regional levels, not at watershed scales (see sidebar). In addition, coastal watershed plant communities are adapted to variables associated with local topography, as well as exposure to sun, wind, and precipitation; they will have highly variable responses to the local effects of climate change (Scavia et al. 2002, USGS n.d.). This uncertainty notwithstanding, it’s widely accepted that certain plant communities are particularly vulnerable to climate change. For example, tidal wetland vegetation bordering hard coastal defenses such as dikes, seawalls, and other armoring structures are unlikely to be permitted to migrate inland in response to rising sea level (Scavia et al. 2002, Erwin 2009). Rising air temperatures or changing groundwater hydrology may also reduce the viability of habitats supporting already endangered species such as the Western lily (Lillium occidentale), and may impede their reproductive function (USFWS 2009). In addition to being vulnerable to sea level rise, tidal wetlands will be affected by the expected increase in the frequency and severity of extreme weather events and associated wind-generated waves, which are expected to erode exposed wetlands and potentially alter their hydrological characteristics (see sidebar)(Erwin 2009, Scavia et al. 2002). Research suggests that extreme hydrological changes (e.g., changes in the frequency and duration of storm-generated flooding) can cause “sudden and dramatic changes in the abundance and spatial arrangement of dominant plants” (Gitlin et al. 2006). Storm-generated alterations to freshwater runoff have been shown to change the salinity gradient in estuaries, potentially resulting in recruitment of freshwater plant species in brackish and saline habitats (Scavia et al. 2002, Dettinger and Cayan 1995). Although most research focuses on the anticipated effects of extreme weather events, experts point out that even low energy storms can create flooding events, which can reduce habitat availability (especially if these events correspond with high tides)(USGS n.d.). One important caveat is that these flood events also deliver sediment to marshes, which is an essential process to assure their persistence (Scavia et al. 2002, USGS n.d.). Vegetated tidal wetlands form and are maintained through the accumulation of tidally-delivered sediments and organic material in a process called “vertical accretion.” The rate of vertical accretion determines the fate of tidal wetlands in the face of sea level rise (SLR). Wetlands whose vertical accretion rates keep pace with SLR will remain largely unaffected, while those not keeping pace will change dramatically. Although the fate of southern Oregon coast’s tidal wetlands remains uncertain, researchers suggest substantial change may occur under moderate and extreme SLR scenarios. Researchers estimate that Bandon Marsh National Wildlife Reserve may lose anywhere from 19% (+40 cm SLR) to 92% (+200 cm SLR) of its forested swamp habitat by 2100. Further research suggests that high, mid, and low marsh emergent plant communities on Bull Island on the Coos estuary (Upper Bay subsystem) could convert entirely to a low marsh plant community under moderate SLR scenarios (+ 63 cm), and convert entirely to non-vegetated mudflat under extreme SLR scenarios (+ 142 cm). The El Niño Southern Oscillation (ENSO) is a cyclical climatic pattern that affects weather and ocean currents in and around the Pacific ocean. ENSO is an event that tends to occur every two to seven years and is characterized by anomalous warming of tropical Pacific waters. Locally, this warming is associated with drier conditions, warmer temperatures, and lower precipitation and streamflow, although it can also result in greater winter “storminess” and flooding. Sea level rise (SLR) poses “the most obvious threat to coastal wetlands” (see sidebar)(Scavia et al. 2002). Although the magnitude of SLR on the Pacific coast varies substantially according to varying rates of tectonic elevation change (SLR at Astoria, OR = -0.27 mm/yr; SLR at Eureka, CA = +4.32 mm/yr), it’s very likely that much of the Pacific Northwest will experience more frequent occurrences of erosion and tidal inundation by 2100 (Mote et al. 2008, Glick et al. 2007, Dalton et al. 2013). Under modest to extreme SLR scenarios, experts project that nearshore habitats on the Oregon coast could face a “dramatic shift in their composition” (Dalton 2013)(see sidebar). Many of the region’s tidal freshwater marshes and swamps are expected to convert to brackish marshes due to seawater intrusion from rising sea levels (Glick et al. 2007, Scavia et al. 2002). These changes have the potential to reduce the extent of tidal freshwater marshes and swamps if those habitats are prevented (by hardened shorelines like dikes, sea walls, and other structures) from migrating further inland in response to SLR (Glick et al. 2007, Scavia et al. 2002, Erwin 2009, Dalton et al. 2013, Shaughnessy et al. 2012, Hartig et al. 2002). Because inland migration will be possible for tidal wetlands in some systems and the elevation of some wetlands will keep pace with SLR though natural processes (vertical accretion- see sidebar), the changes described above will not necessary result in the loss of wetland area (Reed 1990, Erwin 2009). While wetland areas may not change dramatically, even small persistent changes in sea level are likely to affect the distribution of species with narrowly defined habitat requirements. Changes in plant community distribution are particularly important for rare and endangered species. Two rare plant species, silvery phacelia (Phacelia argentea) and wolf’s evening primrose (Oenothera wolfii) occur just south of the project area. If climate change results in favorable conditions for the northward expansion of these species, the project area could represent an important refuge for plant species struggling to survive in nearby ecosystems. However, it should also be noted that climate-related habitat changes could have deleterious effects on rare and endangered plant species that are not well suited to adaptation (e.g., Western lily)(USFWS 2009). SLR may be intensified by cyclical long term climatic patterns (see sidebar). For example, Barnard et al. (2011) note that El Niño events may increase regional sea level by as much as 30 cm (~12 in) for several months at a time. Historically, these events have been associated with increased coastal erosion and flooding. They’re likely to periodically intensify the effects of SLR in the future (Dalton et al. 2013). Changing weather patterns are likely to affect many other important natural processes that influence the productivity and function of marsh habitats, including evapotranspiration, biogeochemical processes, sediment accumulation, fire regime, tidal and storm water inundation regime, and wave energy (Burkett and Kusler 2000, Gornitz 2001, Gornitz et al. 2001, IPCC 1998, Karl et al. 1995, USGCRP 2000, USGS n.d.). The persistence of eelgrass (Zostera marina) beds that are relatively exposed (e.g., in the South Slough Subsystem) may be jeopardized if more frequent and intense storms result in larger storm-generated waves propagating through the lower estuary (Cornu et al. 2012). Altered weather patterns have been known to effect “phytopathology” (i.e., diseases and infections in plants). Although research on the anticipated effects of climate change on phytopathology is limited, the existing literature generally concludes that climate change is likely to alter plant-pathogen interactions (Coakley et al. 1999, Chakraborty et al. 2000, Garrett et al. 2006). Abiotic stressors resulting directly from climate change (e.g., warmer temperatures and drought) may alter plant susceptibility to pathogens (Garrett et al. 2006). Climate-related changes may also affect phytopathology indirectly by altering the structure of existing plant communities. For example, research shows that increased plant density tends to create wetter conditions in vegetated areas, thus increasing the likelihood of infection from certain pathogens (e.g., foliar pathogens)(Burdon 1987, Huber and Gillespie 1992). These anticipated changes may exacerbate phytopathology concerns that already exist in the project area. In particular, prolonged wet weather in spring is very conducive to Swiss needle cast infection (Stone et al. 2008, Zhao et al. 2011), which causes premature needle loss (i.e. 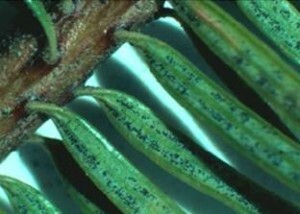 “casting” of needles) in Douglas fir trees, resulting in substantially reduced growth and potentially eliminating the ability to compete with neighboring trees (Shaw 2008). Although the long term effects of elevated atmospheric carbon dioxide (CO2) on aquatic, emergent, and terrestrial plant growth, nutrient cycling, and other ecosystem processes are uncertain, some research suggests that more CO2 (a condition often associated with warmer temperatures) may correspond to greater plant growth in forested and emergent wetland systems, especially in seedlings (Rozema et al. 1990, 1991; Farnsworth et al. 1996; Ball et al. 1997; Scavia et al. 2002). However, it’s important to note that these benefits may be offset by other climate-related changes that would limit plant production (e.g., changes in precipitation, nutrient delivery)(Scavia et al. 2002). In some cases, the persistence of endangered species may be jeopardized by increasing local air temperatures. For example, researchers in northern California suggest that springtime air temperature explains much of the variation in the timing of Western lily reproduction across its range (Bencie and Imper 2003a, 2003b). Since the Western lily requires specific temperatures to facilitate reproduction, it’s likely that climate change will add additional stressors to this endangered species (USFWS 2009). Ball, M.C., M.J. Cochrane, and H.M Rawson. 1997. Growth and water use of the mangroves Rhizophora apiculata and R. stylosa in response to salinity and humidity under ambient and elevated concentrations of atmospheric CO2. Plant, Cell, and Environment 20: 1158-1166. Barnard, P. L., J. Allan, J. E. Hansen, G. M. Kaminsky, P. Ruggiero, and A. Doria. 2011. The impact of the 2009–10 El Niño Modoki on US west coast beaches. Geophysical Research Letters, 38(13). Bencie R. and D. K. Imper. 2003b. Summary report, Western lily vegetation strategy, Crescent City Marsh Wildlife Area and Table Bluff Ecological Reserve. Unpublished report prepared under Interagency Agreement California State University and California Department of Fish and Game, Redding, California. Buffington, Kevin, Karen Thorne, Bruce Dugger, Glen McDonald, Rich Ambrose, Chris Janousek, Glenn Gutenspergen, Chase Freeman, Lauren Brown, and James Holmquist. 2015. Coastal Ecosystem Response to Climate Change (CERCC): Sea-level rise effects on tidal marshes along the Pacific Coast. [Unpublished work]. Accessed March 19 2015 at Coos Estuary Research Symposium. Burdon J. J. 1987. Diseases and Population Biology. New York: Cambridge Univ. Press. Chakraborty, S., A. V. Tiedemann, and P. S. Teng. 2000. Climate change: potential impact on plant diseases. Environmental Pollution, 108(3), 317-326. Clough, J. S. and E. C. Larson. 2010. 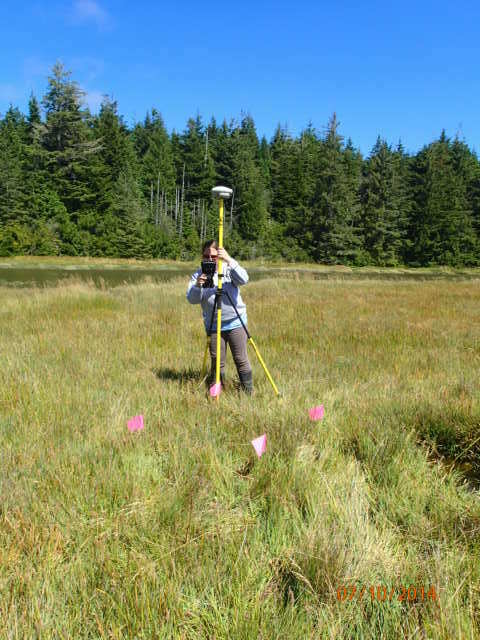 Application of the Sea-Level Affecting Marshes Model (SLAMM 6) to Bandon Marsh NWR. Warren Pinnacle Consulting, Inc. Report to U.S. Fish and Wildlife Service, National Wildlife Refuge System, Division of Natural Resources and Conservation Planning Conservation Biology Program. Coakley, S. M., H. Scherm, and S. Chakraborty. 1999. Climate change and plant disease management. Annual Review of Phytopathology, 37(1), 399-426. Cornu, C. E., J. Souder, J. Hamilton, A. Helms, R. Rimler, B. Joyce, F. Reasor, T. Pedersen, E. Wright, R. Namitz, J. Bragg, and B. Tanner. 2012. Partnership for Coastal Watersheds State of the South Slough and Coastal Frontal Watershed. Report prepared for the Partnership for Coastal Watersheds Steering Committee. South Slough National Estuarine Research Reserve and Coos Watershed Associations. 225 pp. Dettinger, M. D. and D. R. Cayan. 1995. Large-scale atmospheric forcing of recent trends toward early snowmelt runoff in California. Journal of Climate 8:606–623. Dijkema, K. S. 1987. Geography of salt marshes in Europe. Zeitschrift Fur Geomorphologie 31: 489–499. Erwin, Kevin L. 2009. Wetlands and global climate change: the role of wetland restoration in a changing world. Wetlands Ecology Management. 17: 71-84. Farnsworth, E.J., A.M. Ellison, and W.K. Gong. 1996. Elevated CO­2 alters anatomy, physiology, growth, and reproduction of red mangrove (Rhizophora mangle L.). Oecologia 028: 599-609. Garrett, K. A., S. P. Dendy, E. E. Frank, M. N. Rouse, and S. E. Travers. 2006. Climate change effects on plant disease: genomes to ecosystems. Annual Review of Phytopathology. 44, 489-509. Gitlin, A. R., C. M. Sthultz, M. A. Bowker, S. Stumpf, K. L. Paxton, K. Kennedy, and T. G. Whitham. 2006. Mortality gradients within and among dominant plant populations as barometers of ecosystem change during extreme drought. Conservation Biology, 20(5), 1477-1486. Glick, P., J. Clough, and B. Nunley. 2007. “Sea-Level Rise and Coastal Habitats in the Pacific Northwest.” National Wildlife Federation, Seattle, WA. Hartig, E. K., V. Gornitz, A. Kolker, F. Mushacke, and D. Fallon. 2002. Anthropogenic and climate-change impacts on salt marshes of Jamaica Bay, New York City. Wetlands, 22(1), 71-89. Karl, T. R., R. W. Knight, D. R. Easterling, and R. G. Quayle. 1995. Indices of climate change for the United States. Bulletin of the American Meteorological Society 77:279–292. Kolker, A. S., S. L. Goodbred Jr., S. Hameed, and J. K. Cochran. 2009. High-resolution records of the response of coastal wetland systems to long-term and short-term sea-level variability. Estuarine, Coastal and Shelf Science 84: 493–508. Mysak, L. A. 1986. El Niño, interannual variability, and fisheries in the Northeast Pacific Ocean. Can J Fish Aquat Sci 43:464–97. National Research Council (NRC). 2012. Sea-Level Rise for the Coasts of California, Oregon, and Washington: Past, Present, and Future. The National Academies Press, Wash¬ington, DC. 201 pp. Oregon Climate Change Research Institute (OCCRI). 2010. “Chapter 6. Impacts of Climate Change on Oregon’s Coasts and Estuaries”, in Oregon Climate Assessment Report. K.D. Dello and P.W. Mote (eds). College of Ocean¬ic and Atmospheric Sciences, Oregon State University, Corvallis, OR. Reed, D. J. 1990. The impact of sea-level rise on coastal salt marshes. Prog. Phys. Geog. 14 (4), 465–481. Rozema, J. G.M. Lenssen, R.A. Broekman, and W.P. Arp. 1990. Effects of atmospheric carbon dioxide enrichment on salt-marsh plants. p. 49-54. In J.J. Beukema (ed. ), Expected Effects of Climatic Change on Marine Coastal Ecosystems. Kluwer Academic Publishers, Amsterdam, the Netherlands. Rozema, J., F. Dorel, R. Janissen, G.M. Lessen, R.A. Brooekman, W.J. Arp, and B.G. Drake. 1991. Effect of elevated atmospheric CO2 on growth, photosynthesis and water relations on salt marsh grass species. Aquatic Botany 39:45. Shaughnessy, F. J., W. Gilkerson, J. M. Black, D. H. Ward, and M. Petrie. 2012. “Predicted Eelgrass Response to Sea Level Rise and its Availability to Foraging Black Brant in Pacific Coast Estuaries.” Ecological Applications 22 (6): 1743-1761. doi: 10.1890/11-1083.1. Shaw, D. 2008. Swiss Needle Cast of Douglas-fir in Oregon: Forest Health Fact Sheet. University of Oregon Extension Service. EC 1615-E.
Stone, Jeffery K., Leonard B. Coop, and Daniel K. Manter. 2008. Canadian Journal of Plant Pathology. 30:169-176. United States Global Change Research Program (USGCRP). 2000. Climate change and america: overview document. A report of the national assessment synthesis team. US global change research program, Washington DC. Zhao, Junhui, Douglas B. Mainwaring, Douglas A. Maguire, and Alan Kanaskie. 2011. Regional and annual trends in Douglas-fir foliage retention: Correlations with climatic variables. Forest Ecology and Management. 262: 1872-1886.